Extra security and rain didn't put a damper on the McDonald's Thanksgiving Day Parade in Chicago. CHICAGO (WLS) -- Extra security and rain didn't put a damper on the McDonald's Thanksgiving Day Parade in Chicago. The parade got started at 8 a.m. Thursday on State Street in the Loop. Rain and extra security didn't put a damper on the McDonald's Thanksgiving Day Parade in Chicago on Thursday, Nov. 26, 2015. Fans of one of the nation's largest Thanksgiving Day parades began arriving before dawn for a spot on State Street to either carry on a tradition, or start one of their own. "Well, I made my family get up at 5 o'clock this morning and take the train down here to get these seats," said Kathy Priest, visiting from Paine, Ohio. "The highlight of this trip is to see my family. I have been living in Mexico, so family time is number one. This is an added bonus," said David Lapides, visiting from Mexico. Actor David Arquette was this year's grand marshal. There were also many proud parents in the crowd. "It is our first year here, our daughter is marching in the parade," said Cindy Pincha, of Joliet. "She's a Western Illinois University Westernette!" "Our daughter is in the marching band for Maine South," said Justin Gerbich, of Park Ridge. "We're very excited. They do a great job, a great job. They really work hard and they are excited to be here." The parade stepped off Thursday morning with Ronald McDonald in a giant shoe. ABC7's Ravi Baichwal asks a young parade-goer: "How excited are you?" "I'm kinda creeped out," said Andon Failma, 9. "Because Ronald is staring at me." Baichwal asks: "Think you might change your attitude when he gets closer?" We're pretty sure he did along with all the faces, young, old and even canine - that enjoyed some 93 floats delighting the State Street crowd from Congress to Wacker. "It's awesome," said Parker Harrison, 6, of Naperville. "It's awesome because it is so awesome it is almost Christmas and they do this for Christmas and for God." As the first float made its way north on State Street, Chicago police were stationed every 100 feet along the parade route. There were social media reports that protestors might try to get in on the parade to voice their discontent over the police shooting on Laquan McDonald. That did not happen. "With the heightened alert overseas and then the city itself they are going to take extra precautions. Most you don't even see, you don't even realize, but for all of these large scale events they do their homework very well in advance," said Chicago Fire Dept. 1st District Chief Timothy Sampey. Parade "Super Marshall" Brian Duermit says one of the biggest challenges is the weather. "Like today, it was raining so hopefully the balloons are all filled up and not wet and hope they come down the parade real well," Duermit said. In the meantime, delighted fans - including ones who know what it's like to march - have a memory of a mild-weather parade they're not likely to forget soon. 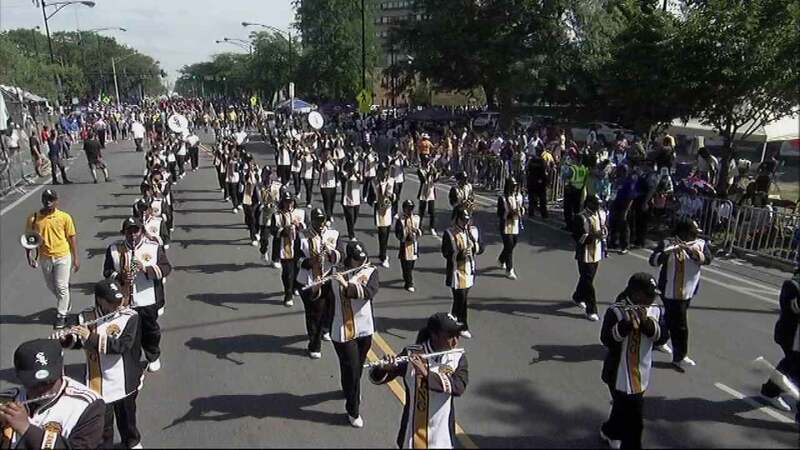 "With all the TV, all the cameras and stuff going down it is extremely nerve-wracking," said Samathan Gibson, a former marching band member.